Summer is here, and that means summer vacation. If you’re one of the many Americans who travel in the summer months, you’re probably getting ready to pack a bag and head out of town for a few days. Based on The State of the American Traveler tourism research, travelers are more and more heavily using their mobile devices throughout the travel process. That means that we not only use our devices to start planning a trip, but also use them as we travel. Applications (or Apps) on our devices exist for every kind of need, from predicting traffic conditions to sharing selfies, and are popping up everywhere, allowing us to be ever more connected to the people and places around us. In tourism-related apps, today you can even buy an international flight and set up an entire itinerary with the use of an app. Imagine what our grandmothers would think if they heard that! Can I go so far as to say that travel apps have become essential to people’s lives? To find my favorite travel apps, I started with a list of the most useful things one needs while traveling. 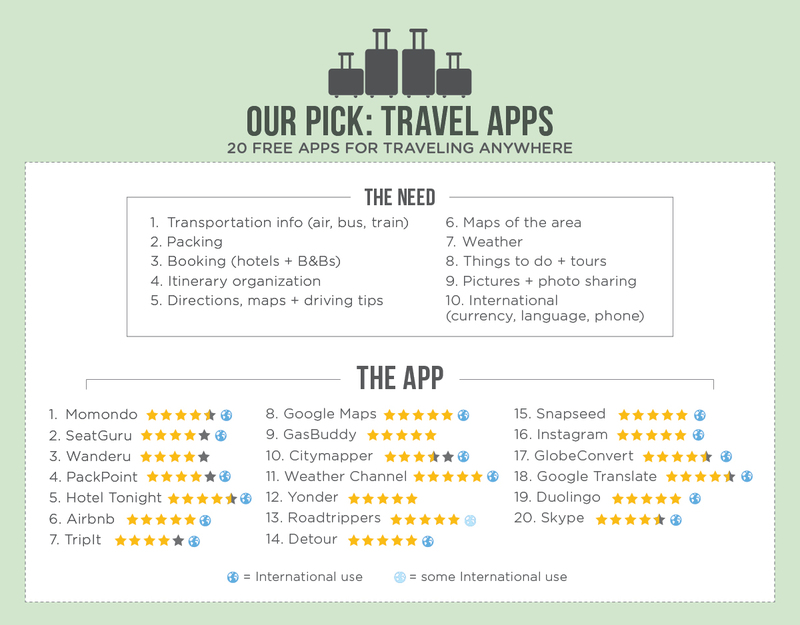 Then I tested a large group of apps, and found the best fit for traveler needs. I’ve gathered some that will help you plan your trip and find cheap gas during your drive, and others that will give you tips and daytrip ideas for the places you’re visiting. I’ve also made a special note of apps that can be used internationally (marked with “International use” at the end of the description, or the globe icon on our accompanying graphic) or are more geared towards international travel, such as currency and language translation (towards the end of the list). I hope you find these apps as useful as I have and, as always, happy travels! Momondo – Find flights and hotels, compare times and costs with the app’s “cheapest,” “quickest” and “best” categories and be directed to various websites on which you can purchase airfare and hotel itineraries. 4.5 stars for ease of use, nice visuals and overall feel. International use. SeatGuru (by Trip Advisor) – Going on a flight and want to know the skinny on the seating situation? SeatGuru gives you layouts of specific jets and reviews of certain seats, plus photos of the cabin so you’ll know exactly what to expect. Know which seats to avoid, and which will give you that blissful calm you’re looking for during your flight. 4 stars for clarity, readability and helpfulness of reviews. International use. Wanderu – If you’re going on a trip, but taking buses and trains versus planes, this app has you covered. Add a start and end destination and discover multiple options based on cost, duration and time of travel. Then be directed to the Amtrak, Greyhound or other public transportation service website to book your trip. 4 stars for ease of use, details on pickup locations and visuals depicting WIFI and plug outlets on the bus or train. PackPoint – Do you always stress about forgetting to pack socks like I do? This app will help prep your suitcase based on where you’re going, what activities you’re looking to do and even what the weather will be like at your destination. Create your packing list by choosing from a multitude of activity options, then check off items in the app, or email the list to yourself. The app will give you the expected weather for your destination, and will create a URL so you can access your packing list from anywhere. 4 stars for convenience, nice visuals and options for using on multiple platforms. International use. Hotel Tonight – For those looking for hotel options early or last minute, this app is geared towards helping you quickly choose a hotel based on location, amenities and reviews. Once you find an option, you can review the “why we like it” and “what guests think” sections, then book your stay through the app. 4.5 stars for readability, photos, maps, reviews and through-app booking. International use. Airbnb – Want to go the cheaper route and still find a great stay in your destination? The Airbnb app helps you quickly identify reasonably priced bed and breakfast options, read reviews of your host and easily book your stay. 5 stars for ease of use, range of B&Bs, photos and ability to communicate with the host through the app. International use. TripIt – Now that you’re set up with your hotel and itinerary, there’s an easy way to keep track of your entire trip. Simply forward any flight, hotel, tour or meeting confirmation email to the specific TripIt email, and then watching as the app creates a thorough itinerary list for your trip. 4 stars for concept, ease of use and the ability to view itinerary offline. International use. Google Maps – After trying both Google Maps and Apple Maps, I recommend Google Maps because of its accuracy, ease of use and links to other Google products. If you’re traveling abroad, you can even take an interactive snapshot of the map and save it for later use. 5 stars. International use. GasBuddy – On the road, and need to get gas? Simply open the app and you’ll be able to see a detailed list of the gas stations closest to you listed by gas price. Down to the quarter mile, GasBuddy gives you the location and name of each gas station so you know how best to save your dollars. The app is constantly updated by users to reflect the most current gas prices. 5 stars for helpfulness, ease of use and accuracy. Citymapper – When you’re visiting a city, the first thing you need to know about is the transit system, so you can find your way around. With this app, you can pull up real-time transit maps, get details on delays and closures for metro stops, plan a route and estimate distance to specific attractions. Maps are available for over 30 cities from New York to Singapore. 3.5 stars for visuals, information and ease of use. International use. The Weather Channel App – If you’re like me, the first thing you check in the morning when you wake up is the weather forecast for the day, so you can plan your outfit accordingly. Now you can get average temperatures, daily and weekly forecasts and road conditions with a single swipe. Simply open the app and swipe down. As a bonus, if you’re worried about too much sun, the app provides the expected UV index count for the day. 5 stars for ease of use, fluidity and design. International use. Yonder – If you’re into outdoor adventures, this app is for you. Yonder gives you a list of parks and outdoor preserves based on either your satellite location or a handy search option. Learn about the environment around you, check out what’s trending and find maps and photos to plan your excursion. 5 stars for information, design, ease of use and the ability to upload photos and add comments. Roadtrippers – Want ideas for a road trip? Or just want to explore the area, grab some grub and see what there is to do? Through the use of twelve different “layers,” the app allows you to search for hotels, dining options and local points of interest. My favorite part of the app is the themed road trip section. Tap on “Trip Guides” and explore trips from tours of the national parks to 48 hours in a given city. There’s even a specific “Filmtrippers” section, with tours that let you explore the filming locations of hit movies and TV shows, including the 1993 hit “Hocus Pocus” and the TV show “The Walking Dead.” 5 stars for information, trip content, design and ease of use. International use, but limited. Detour – An up-and-coming app, Detour provides you with location-based cinematic stories and walking tours. Taking the more personal approach, the app focuses on the experiences of individuals and introduces you to the city you are visiting via their personal stories about the place. So far the app only has seven cities available to tour, but they are continuously adding content, including Chicago and Los Angeles, which will be available later on this year. Each tour page has an overview of what you’ll see, the duration of the trip and what the recommended hours are for your walk. There are also tips for what to avoid and how to prepare, and extra maps so you know where you’re going ahead of time. 5 stars for information and setup, design and ease of use. International use. Snapseed (by Google) – What better way is there to document your trip than to take photos? With Snapseed you can edit your pics with over 20 different tools, filters, blurs and design elements. After you edit, it’s easy to save and export your shots to Facebook, Instagram and other social media accounts. 5 stars for wide range of photo editing options, ease of use and ability to export to other apps. International use. Instagram – This photo-sharing app needs no introduction, and you may already be taking advantage of what it has to offer. After trying several others, Instagram is still my favorite for ease of use, fast uploads and links to social media applications and a handy geo-tagging feature. 5 stars. International use. GlobeConvert – When you travel abroad, the easiest thing to get overwhelmed by is the difference in currency. GlobeConvert has the ability to convert your currency to anything from the Euro to Russian rubles or Nigerian naira. You also have the option to convert things other than currency – there are ten different options including temperature, length, speed and weight. Note that the free version of the app has some ads, but for $1 you can have an ad-free layout. 4.5 stars for ease of use, good readability and variety of conversion options. International use. Google Translate – No doubt you’ve heard of it, and may have even used it before, but do you know about the latest feature of Google Translate? First off, you can hold your device up to a piece of text in a foreign language and watch magic happen, but now you can also scribble text with your finger and the app will transliterate it to written text, and then translate it. Note that as with all translation apps, the translations sometimes can be too literal or a little off, but you’ll still get a base understanding. 5 stars for design, ease of use and multiple translation options. International use. Duolingo – Want to learn a few words in the language of the country you’re traveling to? Simply choose a language, select a level of proficiency and decide how long you want to spend practicing grammar and vocab (from 5-20 min per day). The app will give you a quick overview of new words, and create a fun lesson with images, pronunciation and positive encouragement. 5 stars for creativity, usefulness, and visuals. International use. Skype – My go-to when traveling abroad, Skype allows you to make free calls from virtually anywhere. Chat with family and friends, and keep them up to speed on your travel adventures. If you’re out of WIFI zone, Skype still allows you to call phones outside of the Skype system for a small fee. 4.5 stars for ease of use, wide range of service and multiple platform usage. International use.